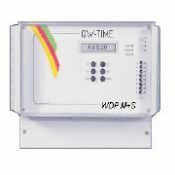 The Franklin WDP M+S is an extremely flexible master clock/ yearly event programmer capable of controlling multiple clock systems, PLUS signal bells, flow valves, motors, lights, locks, HVAC and broad based energy management systems. It will manage virtually any system requiring ON-OFF or DURATION signals related to time or date. Call us at 215-355-7942 to order these items.